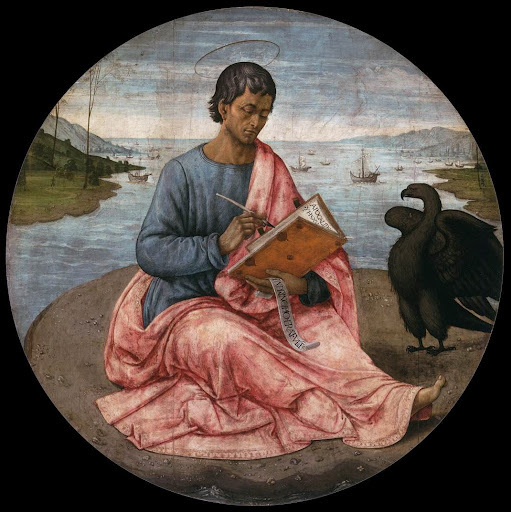 ST. JOHN, the youngest of the apostles in age, was called to follow Christ on the banks of the Jordan during the first days of Our Lord's ministry. He was one of the privileged few present at the Transfiguration and the Agony in the garden. At the Last Supper his head rested on the bosom of Jesus, and in the hours of the Passion, when others fled or denied their Master, St. John kept his place by the side of Jesus, and at the last stood by the cross with Mary. From the cross the dying Saviour bequeathed His Mother to the care of the faithful apostle, who "from that hour took her to his own;" thus fitly, as St. Austin says, "to a virgin was the Virgin intrusted." After the Ascension, St. John lived first at Jerusalem, and then at Ephesus. He was thrown by Domitian into a caldron of boiling oil, and is thus reckoned a martyr, though miraculously preserved from hurt. Afterwards he was banished to the isle of Patmos, where he received the heavenly visions described in tine Apocalypse. He died at a great age, in peace, at Ephesus, in the year 100. Reflection.--St. John is a living example of Our Lord's saying, "Blessed are the clean of heart, for they shall see God."